UNITED NATIONS, Dec. 4, lightly edited Dec. 7 -- As additional information arrives in the wake of last week's sudden re-assignment of Brian Gleeson, the head of the UN Development Program's Office of Human Resources, Inner City Press on Monday morning sought comment from Deputy Secretary-General Mark Malloch Brown, previously the Administrator of UNDP. It is reported by staff that Mr. Gleeson repeatedly invoked Mr. Malloch Brown's name to justify what he called his best practices policies, and stated that Mr. Malloch Brown was going to make him head of the UN Secretariat's Office of Human Resources and Management. In the wide hallway between the UN General Assembly and Security Council, Inner City Press approached Mark Malloch Brown with a series of questions, beginning with a request for comment on the re-assignment of Brian Gleeson. Mr. Malloch Brown replied, "You are a jerk. You are the most irresponsible journalist I've come across." And then he walked away. Inner City Press called after him that there were other questions. Many are contained in the first four installment of this ongoing UNDP series. An additional question, regarding favoritism and entitlement, involved the use not only of UNDP but also of UNFPA, to dole out to a Malloch Brown ally a job in Turkey, sources tell Inner City Press, when the MMB ally's spouse had a UNDP job in Turkey. Numerous staff members have come forward with complaints of favoritism, abuse and threats of retaliation. If Mr. Malloch Brown is right, perhaps they are all irresponsible jerks. But perhaps Mr. Malloch Brown is not right. Another question, which Inner City Press raised Friday to the Secretariat's Office of the Spokesman as well as to UNDP, is how Mark Malloch Brown decided to commission the recent book, "UNDP: A Better Way?" The book's author, Craig N. Murphy thanks as his first acknowledgement "Mark Malloch Brown, who hired me to write this history. He offered the unbeatable combination of... a good salary and travel budget." Mr. Malloch Brown having declined, at 10:44 a.m., to take questions, Inner City Press at noon reiterated the question to the Secretariat's spokesman: how did Malloch Brown decide to have this glowing history writing, how was the author selected and how much was he paid? Was he paid from UNDP core funds? Beyond the still-unspecified "good salary" paid to the author, UNDP retained the copyright. The book, perhaps not surprisingly, effusively praises Mr. Malloch Brown. It is reminiscent, to one UN-immersed reader, of the "Great Book" of Turkmenbashi, the President for Life of Turkmenistan, a volume known as Ruhnama. From the field, UNDP Resident Representatives have over the weekend written to Inner City Press with congratulations for its series on UNDP, which began with a November 29 report on the reassignment of Brian Gleeson. In that report, Inner City Press noted that there were competing theories for Gleeson having been told to resign. More specific information has arrived, that while UNDP is authorized to have some 65 officials at the D-2 level, a recent check found more than 110 officials received D-2 payments and perks. This played a role, as it would in nearly any other organization, in making a change at the top of the Office of Human Resources. Additionally, a letter to a funder nation, purportedly dated November 4 and giving a seven- to ten-day window to respond, was delivered to the nation's representatives after the deadline, a snafu also cited in the re-assignment of Mr. Gleeson. It is reported that Mr. Malloch Brown brought Brian Gleeson into UNDP as a consultant on efficiency, and that this later became a high (and high paying) job at UNDP. This is similar to the current process by which associates of Jeffrey Sachs are being put onto UNDP's payroll outside of UNDP's normal recruitment and hiring procedures. As one specific example, for this mid-day report, Inner City Press is informed that Guido Schmidt-Traub, still listed on the web site of the UN Millennium Project, is already working at and paid by the UNDP Poverty Group. Meanwhile, sources tell Inner City Press, the post Mr. Schmidt-Traub has been given is still purportedly being advertised to create the appearance of a normal recruitment process. More on this in forthcoming reports. UNDP's Communications Office, along with Mr. Kemal Dervis, was asked about this on the morning of Friday, December 1, in written questions reference a deadline of later that day. On Monday the response has been that the questions will be answered sometime this coming week. To date, the candor of the responses, the delay and obfuscation, are not acceptable. Perhaps they are, to adopt a phrase from the hallway, irresponsible. I write as Vietnamese staff member at UNDP Viet Nam. I wish remain anonymous to protect my job, but I feel is my duty to write you about other linkages with Mr. Brian Gleeson and high salary appointments by Senior Management in our Country Office. The story on Mr. Brian Gleason is quite demoralizing for many UNDP staff who carry out their duties with honesty, integrity and fairness... our senior management approved a number of high paying international appointments without following required procedures and regulations of UNDP. Many of us national staff know that former Resident Representative at UNDP Viet Nam Mr. Jordan Ryan (a close friend of Mr. Mark Malloch Brown) and the Deputy Resident Representative of Operations Mr. Neil Reece-Evans (a close friend of Mr. Brian Gleeson) collaborated to recruit through the "back door" an American friend from the past Mr. Jonathan Pincus at very high paying job in our office. 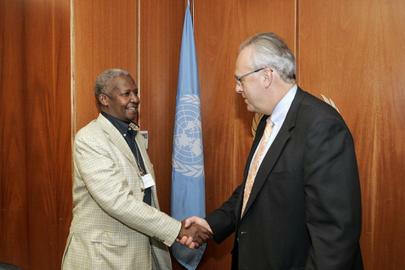 Regarding Kalman Mizsei, by many accounts chased out of UNDP earlier this year after multiple complaints of sexual harassment -- including having brought and hired young women from Central Europe and then applied inappropriate pressure -- it now appears that Mr. Malloch Brown was among those who heard or tolerated Mr. Mizsei's racialist rant in a taxi in South Africa in 2002. "Zero tolerance" for some and not for others, it appears. The UNDP produced, Malloch Brown-commissioned book "UNDP: A Better Way?" refers, at 297, to the UN Millennium Project's "Jeffrey Sachs, the economist whom Malloch Brown had bought in." Given that Mr. Malloch Brown declined, at 10:44 a.m., to take questions, Inner City Press at noon asked this question of the spokeswoman for the president of the General Assembly, who'd been speaking about the Millennium Development Goals: what is the status of the UN Millennium Program, and how many if any of its staffers are being hired by UNDP and on what basis? If not from Mr. Malloch Brown and the Secretariat, and if only after already days-delay from UNDP, then from the General Assembly President's always professional spokeswoman, an answer should soon be forthcoming. In 2005, Mr. Malloch Brown pointedly advised journalists to question their motives. But as seen for example with UNDP's attempt to cover-up that a disarmament program it funded in Uganda resulted in human rights abuses, trying to mislead, intimidate or insult the press doesn't help an institution nor its real-world constituents. As the UN's Jan Egeland again confirmed in agreeing to respond to Inner City Press' questions on Monday, the abuses in Eastern Uganda continue, with nary a word for example on UNDP's Uganda web site. On disarmament, UNDP's presumably non-irresponsible web site Uganda website still trumpets the government's round-up of guns in May 2006, reciting that "Mr. Cornelis Klein, outgoing UNDP Resident Representative, hailed the GoU for having taken a lead in the SALW [Small Arms and Light Weapons] program by, among others, establishing the Ugandan National Action Plan on SALW." Jan Egeland's response on Wednesday about Eastern Uganda's Karamoja region should go online here soon.